Professor Stekler became associated with the Department as a Research Professor in 1994. Previously he had taught at the University of California, Berkeley, The State University of New York, Stony Brook and The Industrial College of the Armed Forces. 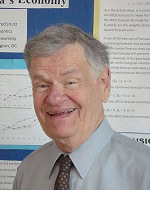 He received his PhD in economics from the Massachusetts Institute of Technology in 1959. His major research interest is in the area of forecasting with a specific interest in the evaluation of macroeconomic predictions. He is also an associate editor and co-book review editor of the International Journal of Forecasting.